During these days militants from various European movements we gather to share experiences of struggles and thoughts on the current housing policy and town at European level in order to learn from each other and create bonds of solidarity between movements and strengthen struggles. The PAH has been present with three presentations: Assemblies, promotion and empowerment; Financialization of cities: Blackstone. And Communication and Networks. With the adoption of self-regulation of markets, the weakening of the welfare state, the erosion of the social model and the global economic crisis has had an unprecedented impact on housing conditions across Europe. The growing processes of commodification, deregulation, reducing public investment, financial activities, have made the conditions of access to decent housing even more difficult and have caused the increase in the number of people in poor housing, victims of forced eviction and a sharp increase in rental prices. What has reinforced the urban and social segregation. 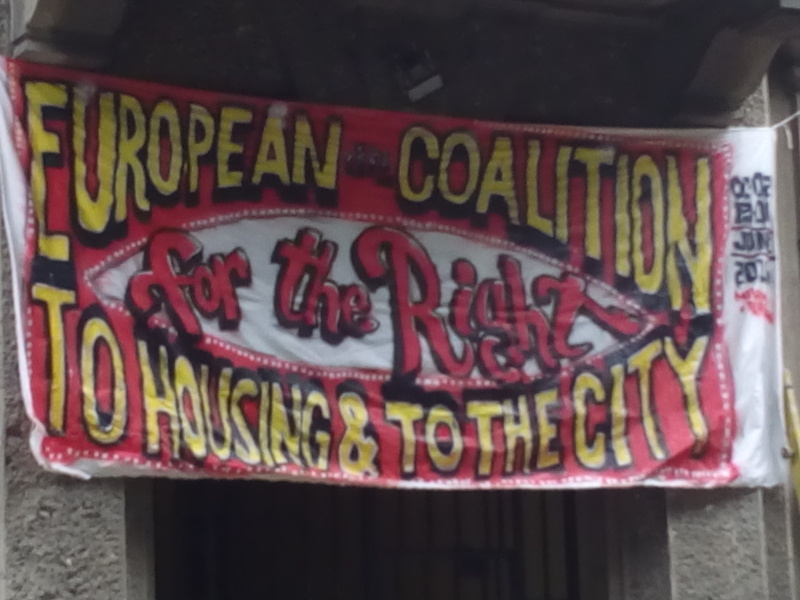 The European Coalition for the Right to Housing and the City is therefore a fundamental convergence of movements in a European area increasingly at the service of finance and deregulation policies affecting fundamental rights, and lead to population to poverty and insecurity in all aspects of life.